Is that the one with Laurence Mooney and some short bloke? It is deplorable. More like gone to ground. He knows he’s in the poo and he’s got form on some of these ‘gags’ being offensive to some people. He’s a smart arsse always has been. Goes to ground to run away from the criticism he deserves. Making fun of a disabled person over a meaningless coin toss. A $5k fine, why even make a joke out of it? I lost all likeness for this moron when he gave us Sarah. The prickk gave us plenty during the saga, well farck him and his football club. ■■■■■■■■ of the highest order. Yeah that one. Jeez it was sht. The bit with Alastair Lynch made me cringe in ways I didn’t think I could. I used to have a big appetite for footy shows but just can’t stomach the blah blah anymore. Having said that, Sam Pang is good value on The Front Bar but I’m not heartbroken if I miss it. The Bounce. Good god how is that still on the air? Apparently yelling makes dumb things funny, well according to the presenters on that show. Will Anderson has made a career out of yelling dumb things. This summarises how I (and it seems a lot of you) feel about the McGuire thing and football commentary more generally. Sad state of affairs. 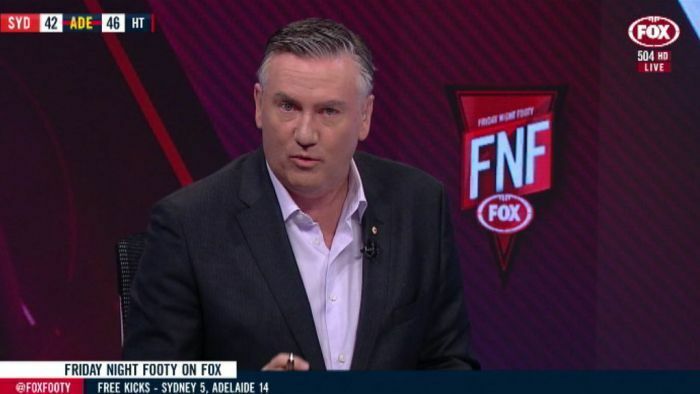 The pertinent question about Eddie McGuire's comments is not about the remarks themselves, but why he would make them during a sports broadcast. Good read. However I’d argue that it was always there and there hasn’t been a degeneration - there’s just been a lot more of it with the amount of sports coverage these days. And it’s tied directly to the appointment of ex-players into these roles based purely on their status in their playing days. There’s simply no other explanation. Don’t come at me with exceptions. You know I’m talking about a trend. I also have a firm belief that it’s direction from higher-ups to try and appeal to non-committed sports fans to make the broadcasts more “entertaining”. General trend of dumbing-down of media Idiocracy etc etc etc I’ve been ranting about this for a decade. Whereas if you look at examples where coverage seeks to help viewers understand what’s going on, more people are drawn in. I point at the Tour de France and Formula 1 as examples of this. Sidenote: Bruce McAvaney is, was and always will be the best in the country at doing this no matter what the sport is and I have never understood the hate he cops for it. I completely agree with you about Bruce. And I also agree about the fact it’s likely a direction from above to make things more accessible. Jimmy Bartel could be AFL’s Tony Romo. Instead we get Ling shouting at us for some reason. I love commentary too. I commentate for some of my chosen sport’s online broadcasts. Commentary is hard, and even harder to do well. Much like coaching, being good at the sport is no indicator at all of being good at explaining it to others. Footy media ■■■■■ me too. 99% is just ■■■■■■■■ blokes waffling on with token women chucked in. I used to love Bruce, but after Kathy Freemans gold medal he has been on the slide. Cometti was good but then he got too concerned about everything being centimetre perfect. And it was annoying they would schedule bruce and Dennis together. BT is my favourite at the moment. But its hard to get exctied about anything with the way we are playing. My sole highlight from the game on the weekend was Stringer bossing everyone doing a 180 and kicking the goal. Ex players dont mind them. But yeh actual commentators doesnt seem to be much quality coming through. Maybe networks not investing enough in the junior ranks like horse racing etc. BT is my favourite at the moment. For all the hype about the breath of fresh air proffered in the ‘new’ age of commentators, it’s a shame when some of those brought in are insufferable for reasons other than blokeiness. I had to hit the mute button all summer during the cricket for one female whose inanity plumbed levels I didn’t know existed. We need to avoid falling into the trap of endorsing people merely because they come from a different demographic. ■■■■■ is ■■■■■ regardless of gender. You mean Alison Mitchell, one of the most respected cricket commentators on earth?